Brad Scott, dealership general manager: Biggest challenge is finding certifiable used vehicles. Thanks to Volkswagen's vigorous support, sales through its certified used-vehicle program are rising this year. The VW brand sold 7,611 certified used vehicles in May, a 5 percent increase from May 2011. In the first five months of the year, it sold 36,355 certified used vehicles, 18 percent more than it sold in the year-earlier period. Industrywide, certified used-vehicle sales in May rose 9 percent to 156,999 over May 2011, according to the Automotive News Data Center. Sales this year through May were up 5 percent to 754,950. One VW certified program enhancement came on Jan. 1. Factory-backed warranties covering VW-brand certified used vehicles became transferable without charge when one consumer buys the vehicle from another. Volkswagen of America dropped the $75 fee to provide peace of mind to buyers of used VW vehicles who might be concerned about the cost of ownership, says Scott Weitzman, VW general manager of used-vehicle operations. "We want to make it as easy as possible to really engage customers with the Volkswagen brand," Weitzman says. "If a customer sells a vehicle that has a [certified used-vehicle] warranty, all the new customer has to do is send a letter -- it's spelled out pretty clearly in the warranty manual -- to Volkswagen and at no cost, we'll transfer it over into their name." Weitzman says the cost of owning a VW vehicle used to be higher than for some other nonluxury brand vehicles, but no longer. He says VW's improved service record and its comprehensive 24-month/24,000-mile certified used-vehicle warranty gives buyers peace of mind about their purchase. Weitzman says a certified-used VW vehicle on a dealer's lot sells in about 30 to 45 days -- about half the time of a noncertified used vehicle -- and has an average transaction price of about $18,000. A typical noncertified VW vehicle has an average price of about $16,000, he says. "This helps us maintain strong residual values when it comes to leasing new products as well as assuring that the cost of ownership is within reason," Weitzman says. As of May, 553 of VW's 600 dealerships participated in the certified used-vehicle program, a spokeswoman says. Weitzman says some VW dealers have not participated in the program because they lack the space to stock enough certified inventory or don't understand its profit potential. So the company has worked hard over the past couple of years to help dealers clear those hurdles, Weitzman says. VW has set up a field staff, online training and workshops aimed at helping dealers with their used-vehicle operations, remarketing and reconditioning, he says. And when dealers move or improve their stores, the company tries to ensure that space and working capital for the used-vehicle department are part of the plan, he says. 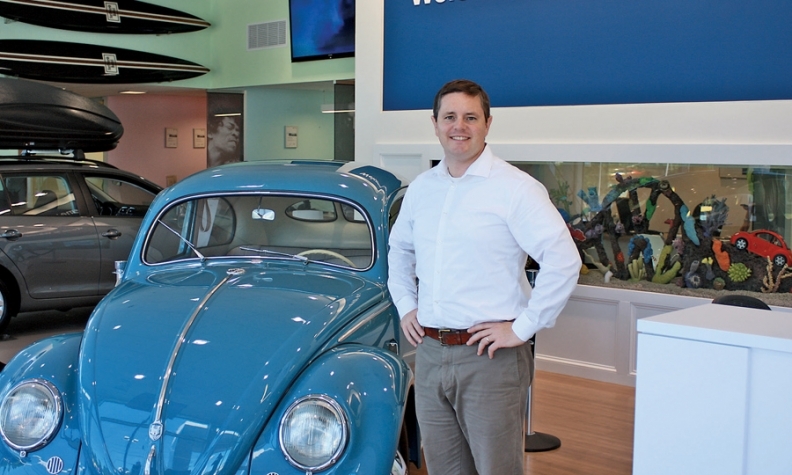 Brad Scott, general manager of Scott Volkswagen Inc. in East Providence, R.I., says certified used-vehicle sales were important to his dealership even before it moved to a larger building in July 2011. They still are. Scott says his used-vehicle sales rose 30 percent to 430 units in 2011. About 30 percent of those used units last year were certified, he says. This year, his certified used-vehicle sales are running about even with the same time last year. His sales have been constrained not by space, but by problems finding the vehicles to sell. A tight supply of used vehicles industrywide has made it difficult for some dealers to find the low-mileage, late-model used vehicles that are the pillars of factory-sponsored certified used-vehicle programs. "It's been difficult sourcing them," Scott says of certifiable used VW vehicles. "That's been the greatest challenge. If we could find the vehicles, we certainly could carry more."